Working on the flux towers was just the beginning. These flux towers exist under a larger international project called CarboAfrica, which links back to CarboEurope, Fluxnet and Ozflux. These are large international collaborations which link various flux tower projects into a coordinated effort (http://fluxnet.ornl.gov/). There are flux towers measuring every manner of ecosystem, particularly those in the Northern Hemisphere. Through these programs, research projects are coordinated, funding opportunities are leveraged, and data are shared. For anyone involved in carbon science, these communities are essential, because they provide support, share resources, and peer review. CarboAfrica was my first taste of international science. I was lucky enough to attend two of the conferences held in Africa to present the results we were finding in Kruger. The first in Accra, Ghana, and the second in Pointe Noire, Congo. Both were eye-opening experiences for me, and I made some new friends from all over the world who were kind enough to pass along some of their knowledge and experiences on to me, from the do's and don'ts of the flux tower instrumentation to modelling tips for gap-filling data. So, what should you know when traveling around Ghana and Congo? Well, Ghana is English speaking, so if you can manage in English, you'll do pretty well. The people there are exceptionally friendly, but terrible drivers. Watching people drive in Ghana makes you realise the importance of proper intersections and road rules. The roads in Ghana are not that great (although they were busy with a major highway project while I was there, which is probably going to be amazing when it's done and change the way people travel there). My boss was along for the Ghana trip, and he wanted to have a look at what savannas were like in Ghana, so we took a bus trip up north towards Kumasi, and so we got to see a lot of Ghanaian driving. My experiences in the wilds has mainly been around Kruger and similar areas. Here, the largest tree you're going to find is a Baobab, but that's mainly in the northern parts of the park. Most of the time, the largest tree is going to be a Marula (about 10 -14 m tall),or possibly an Apple-leaf (15 m) or an African flg tree (20 m) if you're in the riparian zone. All pretty impressive, or so I thought. Sausage tree (Kigelia africana) not far from the Lower Sabie rest camp in the Kruger National Park, about 12 m tall. Image of a Ghanian forest (http://www.futurity.org/earth-environment/diverse-rainforests-resilient-to-drought/) where trees can grow in excess of 60 m in height. 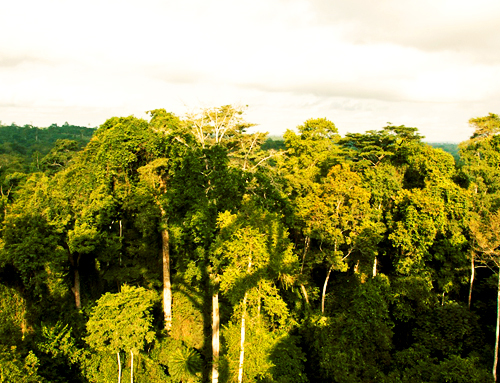 Although Ghana has experienced a lot of deforestation, the remaining forest trees are incredibly huge. I didn't get to see one of them up close and personal, but just seeing them out of the bus window, I felt completely dwarfed by the majesty of these trees. Those trees store a lot of carbon. Very roughly, from literature on rainforest tree species, the trunk diameter of a tree that is 60 m tall is going to be about 2 m. Now, there exists a very strong relationship between the mass of a tree and its diameter (this is called allometry). Using a very generalised equation for rain forest species, a tree which is 60 m tall is then going to weigh about 83 000 kg or 83 tons. Now 1 kg of dried tree material has approximately 0.45 kg of carbon. That means that a 60 m tall tree holds 37 350 kg of carbon. Now how much Carbon dioxide does that relate to? Using a similar logic as used here http://www.icbe.com/carbondatabase/CO2volumecalculation.asp, one ton of carbon in carbon dioxide gaseous form means that you need 2.67 tons of carbon dioxide (since the two oxygen molecules are a lot heavier than the one carbon). Therefore the 38 tons of carbon on this 60 m tall tree would have come from 100 tons of carbon dioxide. In gaseous form, at about 25 degrees Celsius, the volume of one ton of carbon dioxide is 556 200 litres. That means the volume of 100 tons of carbon dioxide is 55 620 000 litres. The volume of an Olympic sized swimming pool is about 2 500 000 litres, and therefore, it would have taken more than 22 Olympic sized swimming pools full of pure carbon dioxide to make one of these trees. That's a lot. When one of these giants goes down, it means that a lot of carbon is going to make its way back into the atmosphere, by one means or another. By the way, if you ever come across an Olympic sized swimming pool fill with carbon dioxide, and you somehow know this (since it will look like a regular old air-filled Olympic sized swimming pool), don't climb in because you will die. So that was my breakthrough during the Carbo Africa conferences, which were both held in countries with rain forests - without these forests, this world is going to be an entirely different place to live in. Probably not one that can accommodate humans. Other things to know about Ghana is that it's really hot, don't leave that sunscreen behind, and it's incredibly humid, particularly in Accra. It's so humid, you could cut the air with a knife.You can bite into the air. Fortunately the local beer is really good. It was a huge relief after a long day to settle at one of the many fine establishments, and have a nice cold beer. The other great thing about Ghana are friend plantains and chili beans. They're delicious. So that's all about Ghana. Pointe Noire was a whole other experience. When traveling in the Congo, it's a good idea to learn some French. I had luckily done a bit of French while in high school, so I managed to struggle along as I murdered the French language. If you only speak English, it's going to be a bit unpleasant. I did a lot less exploring while I was at Pointe Noire, mainly because I was traveling on my own. so I don't have as many stories to tell. One thing I did remark on was how passionate my French colleagues were about their work in Congo and other countries like Gabon. Originating from institutes in France, many of them had spent years of their lives away from home, working on their sites and with the local people. I found their dedication to their work to be commendable because I'm not sure I could live apart from friends and family for that long, and so far away, adapting to a culture so different from my own. So interesting- it's scary to think of the impact a single tree can have, and how many of these are destroyed in rain forests throughout the world.